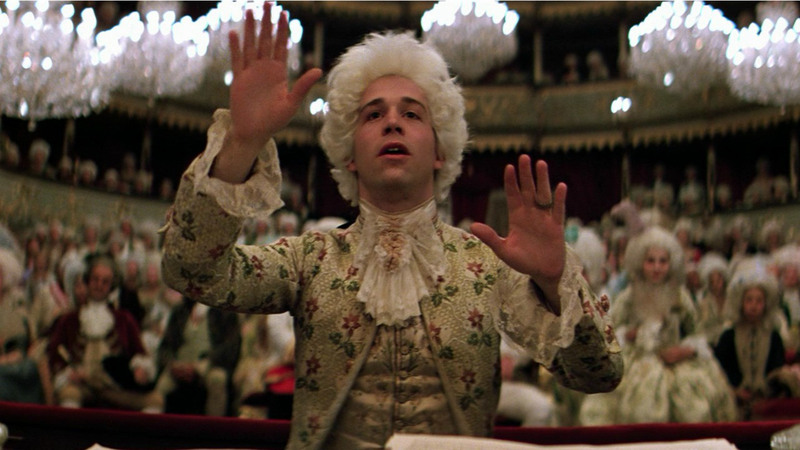 Amadeus (Miloš Forman 1984) was adapted for the screen by Peter Shaffer from his own play. The largely fictional story of a rivalry between Mozart and Vienna court composer, Salieri, takes its inspiration from an 1830 play, Mozart and Salieri, by Pushkin and the subsequent opera of the same name by Rimsky-Korsakov. 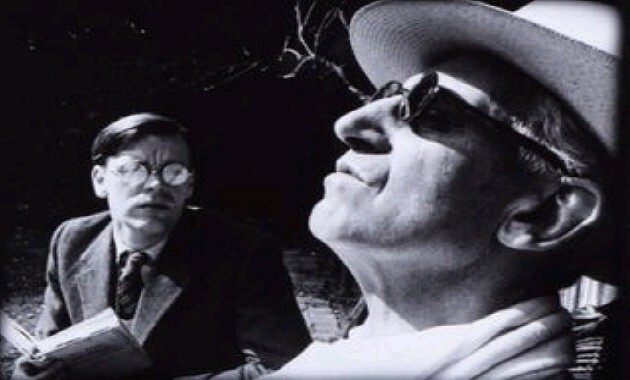 The film sets out two principal themes; the process of artistic creation and the excellent being the enemy of the good. Mozart and Salieri are devices to these ends. Moviegoers hoping for accuracy and truth will be disappointed. This is a movie, not a history lesson. Genius is God-given. Nothing to do with the gene pool. Mozart was as much on a mission from God as Jake and Elwood Blues. I still find Tom Hulce’s turn in the title role to be affecting as it moves between the poles of behaviour. In the final scenes, a dying Mozart dictates the Requiem Mass in D minor to Salieri who transcribes the score. Genius and mediocrity resolved in tragic union. The essence of great cinema, it seems to me. Song of Summer (Ken Russell/BBC 1968) is a black and white film made for the Omnibus series on BBC television. Its subject is the final 6 years of the life of composer Frederick Delius and his relationship with Eric Fenby, a young composer who offers to transcribe Delius’ work as Delius is blind and partially paralysed. This film is part of a body of work that Ken Russell did for the BBC in the 60s. He wanted to redefine the biopic – dispense with the clichés, the blandness and create detail and realism. In this he is aided by a brilliant cast, particularly Max Adrian as Delius. Just as ‘Amadeus’ argues the dichotomy of brilliance and mediocrity, so ‘Song of Summer’ argues the conflict between Delius’ lyrical, haunting music and his tyrannical, vexatious nature. (Although some scholars argue that this ‘disposition’ was largely due to Delius being in the tertiary stages of syphilis) In any event, this film stands as an extraordinary testament to Ken Russell’s own genius – which dissipated significantly in his later years. 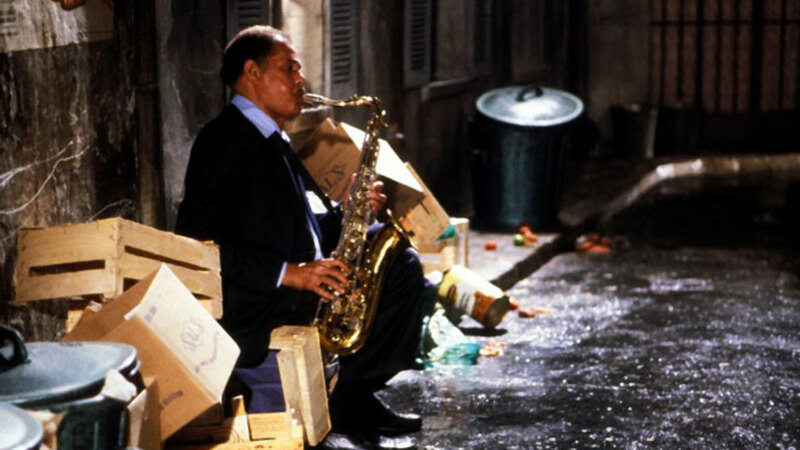 Round Midnight (Bertrand Tavernier 1986) is set in 50s Paris and tells the story of sax player Dale Turner, played by Dexter Gordon. As with the two movies above, the story concerns itself, primarily, with a relationship – as Dale is befriended by Francis, a poster designer, who idolises Dale and sets about rescuing him from alcoholism. Dale’s character in the film is a composite of jazz musicians, Bud Powell and Lester Young. Powell had been befriended, in 50s Paris, by young writer, Francis Paudras, on whose memoir, ‘Dance of the Infidels’, this film is based. The authentic locations, Herbie Hancock’s score, the appearance of several top jazz musicians, including Hancock, and Gordon’s central performance all combine to create the beautiful fragility of a life played out to a jazz score. A lovely film. Bound for Glory (Hal Ashby 1976) tells Woody Guthrie’s story as he emerges from Oklahoma into mid-30s depression America and in particular, the California of the dust bowl refugees. 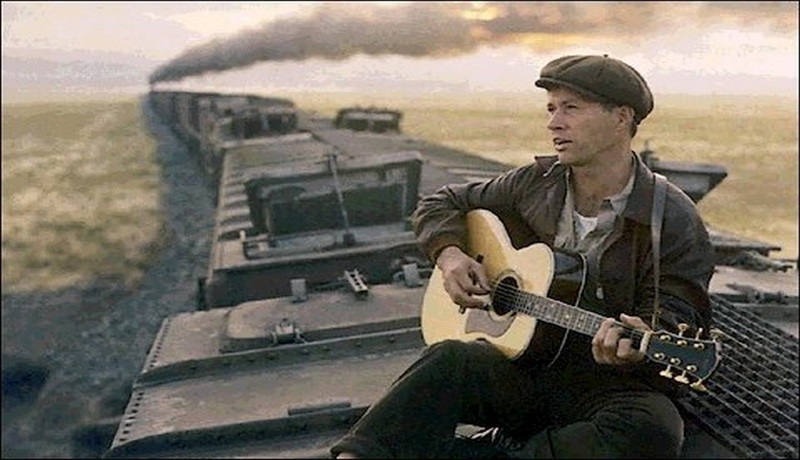 As Woody travels the land, hitching and box car riding, he writes and plays his music. The movie looks and feels authentic. Ashby’s attention to period detail is winning and Garrett Brown’s Steadicam, the first time his invention was used in a movie, gives David Carradine as Guthrie – and the ever-present panoramic scapes – real presence. But it’s all very earnest, very calculated. You want Carradine’s rictus to break into a toothy smile. I’m sure Woody had a sense of humour but Carradine plays him as if the sheer weight of becoming the national troubadour was breaking his back. But 70s movies were often a bit like that, I suppose. When I first saw this film in the 70s, I remember thinking that ‘This Land is Our Land’ would make a much better National Anthem than the ghastly incumbent. I still hold to that view. Well, I’ll take another break and return with the final part shortly. Closing Trivia; When he lived in Denmark, Dexter Gordon, star of ‘Round Midnight’ became friends with the family of the future Metallica drummer Lars Ulrich, and subsequently became Lars’s godfather. My pleasure, Steve. Final episode tomorrow most likely.